Remember, oh, six months ago, when I was trying to learn how to ring a desk bell? I should probably be embarrassed to admit this, but I am still trying to learn it! 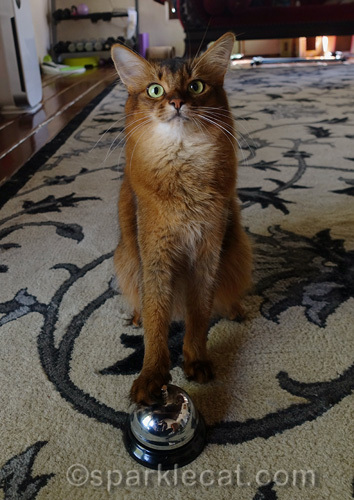 The biggest problem is that Somali and Abyssinian cats have grabby hands, not whappy paws (like some kitties I know). So I keep trying to grab the knob that rings the bell instead of hitting it. A couple of times I even tried to pull the whole bell closer to me. 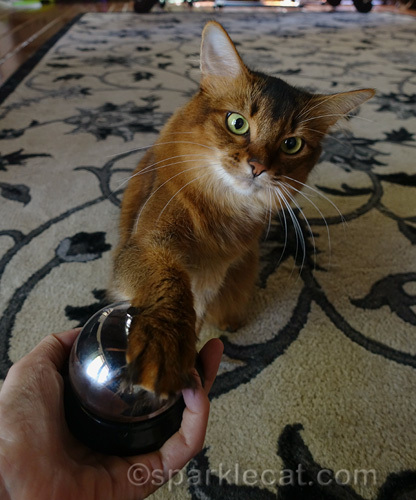 My human heard that holding up the bell makes it easier for me to ring it, so she does that sometimes, to help me get the idea. Don’t worry, there has been progress! I definitely know that when I ring the bell I get a treat! And that when my human accidentally rings it herself, I don’t. I’m just not that consistent yet with the ringing part. I really do want to learn this because there are desk bells at some of the places where I do therapy visits. Wouldn’t it be fun to ring the bells there? Hey, I just rang it again! Such a smart kitty, Summer. We love your persistence, too! DING! You sure can do that better than WE could! Practice makes perfect, Summer! Keep on working at it – we know you will get there! Summer that last photo says it all — we love you expression! 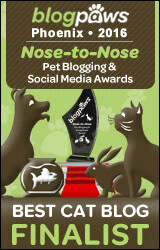 Mommy saw a video on a kitty ringing the bell and humans doling out treat each time the bell rings. Mom LOLs at the video every single time. We can’t wait to see your video. We never think you’re dumb, Summer. The bell just isn’t designed for Somalis, but you’ll master it soon! Great job, Summer. that’s very cool. you keep trying and I know you’ll have success. You are very clever and I am sure you will soon have it off pat. That would be very cool if you rang the desk bells 🙂 Our Prancie has a bell like this that she uses to wake us up, but she throws it off the nightstand to make it ring. 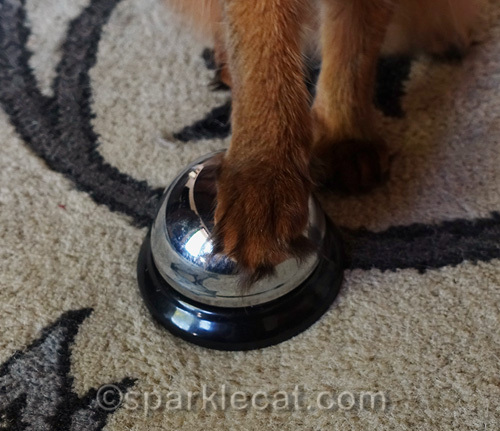 That just must be extra hard for you to learn to pat the bell to ring it…but when you do learn it, since you are so talented and intelligent…and you want your treats, you will have that bell ringing ‘down pat’!! 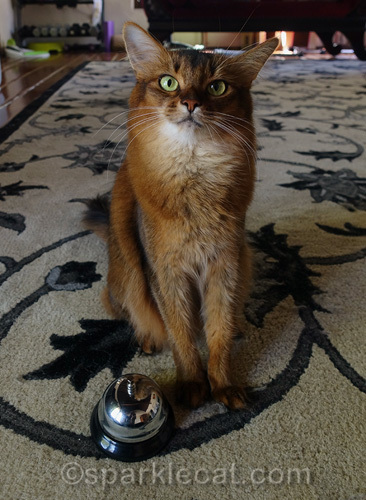 You will have lots of peeps running when you start patting/ringing the bells at the therapy places, MOL!! if theo could learn he’d get a treat for ringing a bell, the bell would be rung 100,000 a day. good luck, you’ll get it down. 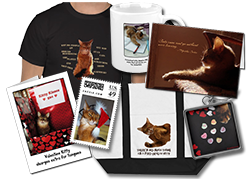 Kitty Cats look so cute, when they use their paws in a playful manner! I love this set of “standing upright, facing forward” photos! Summer you are very talented. I know how to ‘push mom button’ by meow out loud with I want something. I love your crossed paws in the first photo. That is how all the top models pose. Oh, we know you’ll be a pro-bell ringer in no time, Summer. Love that last picture. And her eyes are saying ‘I did it’ Hooray. It looks like you’re doing a great job. I bet that skill will really come in handy for you. Ring that bell, Summer! Summer! That is terrific! And by the way, from your comment to Spitty, you answered a question my mom had about kids with grabby hands! Mom had just begun to wonder if that was a problem anywhere and it seems that it is…kids being kids. You handled it wonderfully and deserve a smooch from your human. I think you’ll get the hang of it pretty Summer, you’re such a smart gal! Oh yeah those people would be very impressed by this. We have never tried ringing a bell so we have no idea how easy or hard it would be. Did you get your treat for ringing it????? 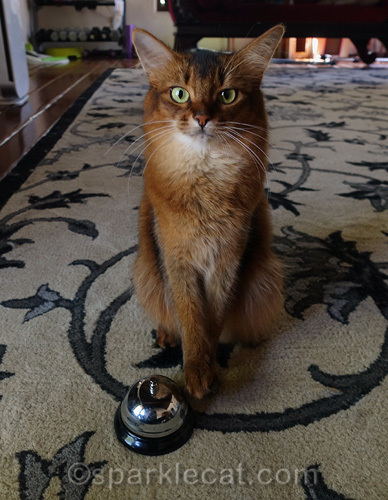 You’ll have to train your human to ring the bell more often so you get extra treats Summer. Good job, Summer! Get all those treats!